Introduction: Fourteen novel 8,8-dimethyl-8,9-dihydro-5H-chromeno[2,3-d]pyrimidin-6(7H)- one derivatives were rationally designed and synthesized successfully. The synthetic procedures adopted for the target molecules were achieved by facile protocols and the yields were good to excellent (> 80%). Method: All the synthesized compounds were characterized by 1H NMR, 13C NMR, HR-MS and FT-IR spectral analysis. All new compounds were evaluated for their in vitro antioxidant activity by using DPPH, ABTS, NO and H2O2 methods. 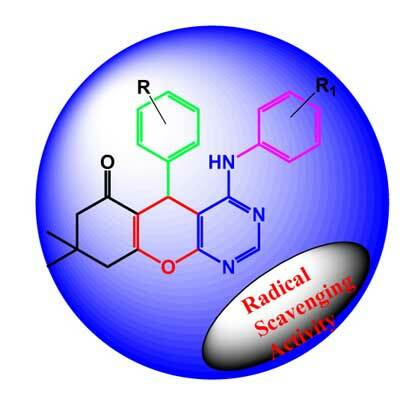 Results: Among the novel derivatives, two of the synthesized compounds exhibited good antioxidant activities similar to ascorbic acid, in all the four tested methods. Keywords: Pyrimidines, synthesis, anti-oxidant activity, simple method, in vitro studies, human body. Keywords:Pyrimidines, synthesis, anti-oxidant activity, simple method, in vitro studies, human body. Abstract:Introduction: Fourteen novel 8,8-dimethyl-8,9-dihydro-5H-chromeno[2,3-d]pyrimidin-6(7H)- one derivatives were rationally designed and synthesized successfully. The synthetic procedures adopted for the target molecules were achieved by facile protocols and the yields were good to excellent (> 80%).